What type of bird food satisfies birds, is easy to use, keeps birds in place for longer views and leaves no mess to clean? The answer to all of the above? Seed cylinders! One of the true benefits of owning the local Wild Birds Unlimited is that I get to try out all of the products! Seed cylinders are convenient as they are held together with a natural gelatin, easy to unwrap as well as easy to place into a feeder. With a tray on the feeder there is no seed on the ground which is certainly a benefit when trying to avoid mammals under the feeders. Seed cylinders are available with a hot pepper coating so that they won’t be attractive to mammals with sensitive taste buds, while birds do not react adversely. Birds need to peck the seeds apart from the cylinder, which means they spend more time at the feeder. And that’s one of the true benefits – the long looks at the various behaviors. 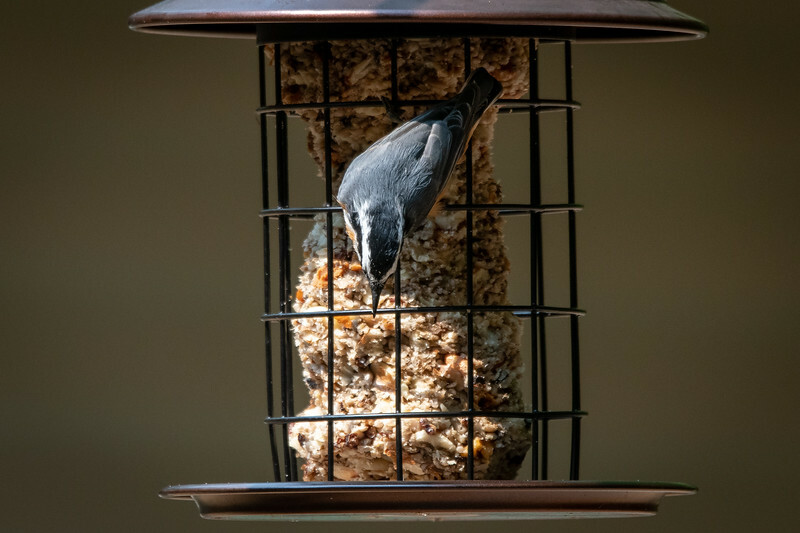 I love the way the Red-breasted Nuthatch lands upside down and with the thinnest of beaks, chips away at the seed until it can fly away with a piece in its’ beak. I watch the bird then fly to the safety of the foliage in the tree above, further pecking the seed down into smaller pieces. There’s No Missing those Jays! 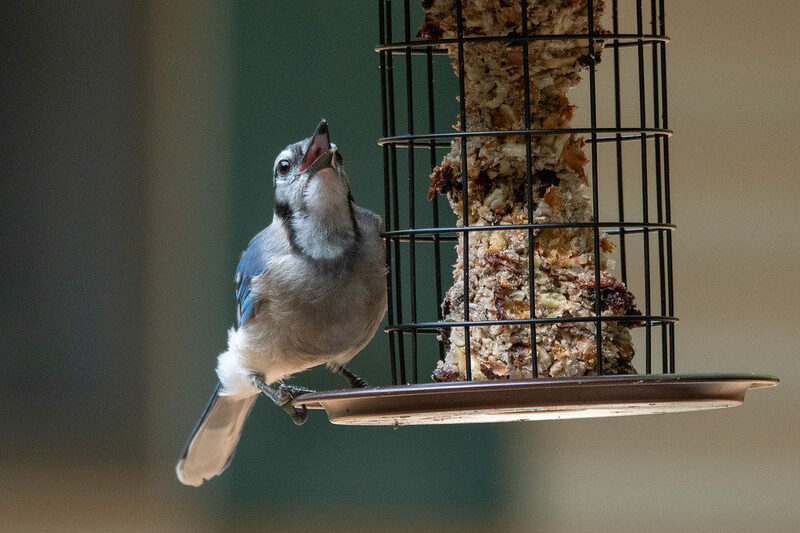 Blue Jays are always excited to see the feeder newly filled. It is as if they are prompted by the sight of the pieces of nuts to scream out for Joy! They really hammer at the pieces with their larger beaks, tossing them down their throat and going for more. Jays have a gular pouch in their throat which allows them to store food and then bring it back up for eating or caching. All of the woodpecker species love to eat at cylinders. It seems as if the pecking at the seed satisfies their urge to feed in a way that is already natural for them. 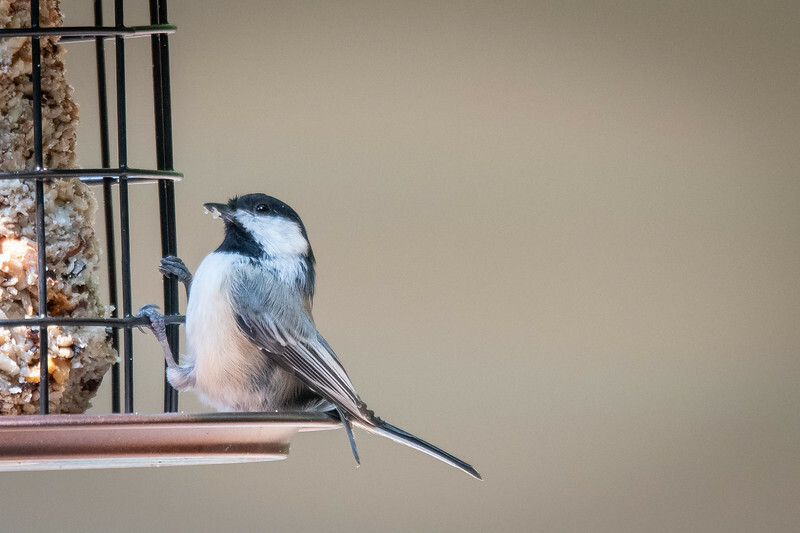 Black-capped Chickadees usually grab a loose seed and quickly scuttle back to the safety of tree branches. With a seed cylinder, they have to work a little longer which is a great way for you to be able to observe them for longer periods of time. The one in this photo looks as if it is having a seat while working on its’ meal.